In some divorce proceedings, couples may ask the court to determine the enforceability of the terms contained in various types of agreements, including a marital separation agreement, a prenuptial agreement, or any stipulation affecting the parties’ rights going forward. In performing this task, a judge often seeks to determine the intent of both parties by reviewing the specific language of the agreement as well as the circumstances surrounding its execution. In some cases, the couple may choose to prepare their own agreements, without the assistance of counsel. Drafting a document that will ultimately affect you and your family’s legal and financial rights requires strict attention to detail. Keep in mind that the agreement must also conform with any local laws and rules applicable to the subject matter. Couples in California who are considering a separation or divorce are highly encouraged to seek the assistance of a local San Diego family law attorney who can work to protect your rights throughout each stage of the process. A recent California case illustrates the importance of obtaining proper legal guidance when preparing agreements that will likely affect the parties’ rights in divorce. Here, the couple’s marriage lasted for 26 years. In 1995, the husband filed for divorce. Neither he nor his wife was represented by counsel. While the husband did not request spousal support, the wife did. In 1996, the husband prepared the stipulation and judgment, which provided (among other things) that the court would reserve “jurisdiction over spousal support for the benefit of both parties until the remarriage or death of either party.” In October 1996, the court entered the stipulation and judgment and did not award spousal support. The husband remarried in the spring of 1997. In 2013, the wife petitioned the court to modify spousal support, citing a “change of circumstances.” Specifically, the wife alleged that she was not able to work anymore. The husband disputed the wife’s entitlement to certain portions of his income. The trial court ordered the husband to pay the wife $2,000 in monthly spousal support, citing the following findings: their middle class standard of living, their total income, their mutual retirement status, and the husband’s ability to pay. The husband appealed the order, arguing that the parties had agreed to waive the court’s jurisdiction to award spousal support on the remarriage of either party, or in the alternative, that the court had failed to comply with the terms of section 4320. On appeal, the court first concluded that the trial court did indeed have jurisdiction to issue an award of spousal support. The court found that the language contained in the stipulation prepared by the husband (and referenced above) was patently ambiguous. Specifically, the court pointed out that the language was unclear as to whether it meant that a supporting party could avoid jurisdiction by remarrying, as the husband did in this case. The court rejected this interpretation, pointing out that, since the wife was the only party who sought spousal support, the language could be interpreted to mean that the court’s jurisdiction to award support would end only if she remarried. Furthermore, the court noted that section 4336, which concerns the court’s retention of jurisdiction to award spousal support in a long-term marriage, contemplates a scenario in which there is a supporting party and a supported party. The husband failed to cite authority to show that the supporting party could circumvent a support obligation by remarrying. The court upheld the support order, concluding that the lower court applied and analyzed the statutory factors set forth in section 4320 of the code. This case nicely illustrates the clear need to consult with an experienced family law attorney in any divorce-related case. 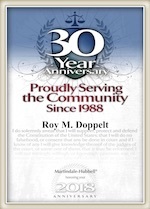 For more than 20 years, Roy M. Doppelt has been representing clients in divorce matters in Southern California. Doppelt and Forney, APLC represents families in Linda Vista, Encinitas, Scripps Ranch, San Diego, and throughout Southern California. For a free consultation with a dedicated and experienced family lawyer, contact Doppelt and Forney, APLC through the law firm’s website or give us a call toll-free at (800) ROY IS IT (769-4748).